I welcome you, and am pleased to receive you. I thank Msgr. José Tolentino de Mendonça for the kind words of greeting he addressed to me on behalf of you all. I greet Msgr. 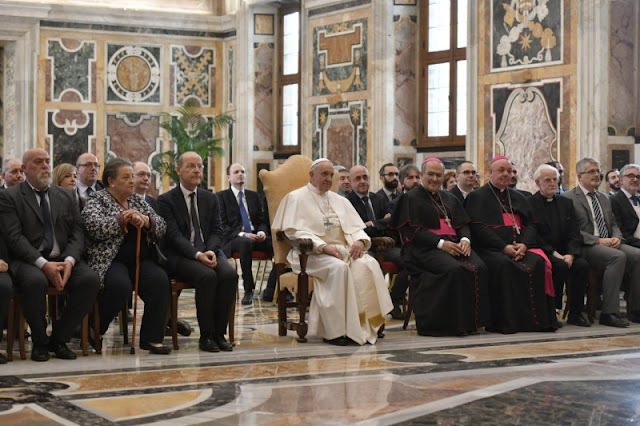 Sergio Pagano, Professor Paolo Vian, the new vice-prefect, and you archivists, writers, assistants and employees of the Vatican Secret Archive, as well as the professors of the Vatican School of Paleography, Diplomatics and Archives. The occasion of this visit – so shortly after my meeting with you and with the Apostolic Library, on 4 December last – is the happy anniversary, just the day before yesterday, of the eighty years that have passed since the election as Supreme Pontiff, on 2 March 1939, of the Servant of God Pius XII, of venerated memory. The figure of that Pontiff, who found himself guiding the Barque of Peter at one of the saddest and darkest moments of the twentieth century, agitated and lacerated by the last world war, with the consequent period of reorganization of the nations and post-war reconstruction, has already been investigated and studied in many aspects, sometimes discussed and even criticized (it could be said with some prejudice or exaggeration). Today he has been appropriately re-evaluated and indeed placed in the correct light for his many qualities: pastoral, above all, but also theological, ascetic, and diplomatic. At the behest of Pope Benedict XVI, since 2006 you Superiors and Officials of the Vatican Secret Archive, as well as of the Historical Archives of the Holy See and of the Vatican City State, have been working on a common project for the cataloguing and preparation of the substantial documentation produced during the pontificate of Pius XII, part of which was already rendered consultable by my venerable Predecessors Saint Paul VI and Saint John Paul II. I therefore thank you, and through you also the other Vatican archivists, for the patient and scrupulous work you have done over the past twelve years, and which you are still partly carrying out, to complete this aforementioned preparation. Yours is a job that takes place in silence and far from clamour; it cultivates memory and in a sense it seems to me that it can be compared to the cultivation of a majestic tree, whose branches reach towards the sky but whose roots are solidly anchored in the earth. If we compare this tree to the Church, we see that it is reaching our towards Heaven, our homeland and final horizon, but the roots sink into the soil of the same Incarnation of the Word, in history, over time. You archivists, with your patient effort, work on these roots and help keep them alive, so that even the greenest and youngest branches can receive good sap for their future growth. This constant and significant effort, on your part and on that of your colleagues, enables me today, in memory of that significant anniversary, to announce my decision to open to researchers the archival documentation related to the pontificate of Pius XII, up to his death at Castel Gandolfo on 9 October 1958. I have decided that the opening of the Vatican Archives for the Pontificate of Pius XII will take place on 2 March 2020, exactly one year after the eightieth anniversary of the election to the See of Peter of Eugenio Pacelli. I have assumed this decision after hearing the opinion of my closest collaborators, with a serene and confident mind, sure that serious and objective historical research will be able to evaluate, in the proper light and with appropriate criticism, the praiseworthy moments of the Pontiff and, without any doubt, also moments of serious difficulties, of tormented decisions, of human and Christian prudence, which to some might have seemed to be reticence, and which instead were attempts, humanly also very hard-fought, to keep the flame of humanitarian initiatives lit during periods of more intense darkness and cruelty, of hidden but active diplomacy, of hope in possible good openings of hearts. The Church is not afraid of history; rather, she loves it, and would like to love it more and better, as God does! So, with the same trust of my predecessors, I open and entrust to researchers this documentary heritage. While I thank you again for the work accomplished, I wish you continued efforts to provide assistance to researchers – scientific and material assistance – and also in the publication of the Pacellian sources that will be considered important, as you have been doing for some years. With these sentiments, I warmly impart my Apostolic Blessing to you and ask you, please, to pray for me.